FC Goa squares off against a dejected Chennaiyin FC squad to finish off their season at the Jawaharlal Nehru Stadium, Goa, this Thursday. FC Goa will take this game as a pre-test for the playoffs. Goa had been making a magnificent run for the past two months, before falling to a 3-0 defeat against Bengaluru FC in the previous game. Sergio Lobera's only objective now would be to retain the 2nd position on the table. Coming to the end of yet another memorable season for the Gaurs, they wouldn't be satisfied with anything less than the cup this year. The story has been a complete contrast for Chennaiyin FC this season. From being crowned champions last season, they are now at the bottom of the table with only 9 points. The two wins against Bengaluru FC and Pune City proved to be the only consolation for the Marina Machans. CFC had things going wrong right from the start, with Jeje Lalpekhlua running out of form and the attack lacking shape. John Gregory would now be hoping for a change of fortunes in the AFC Cup next month. FC Goa does not have any injuries or suspensions and has the full squad available for the game. Chennaiyin FC too ends the season without injuries or suspensions. 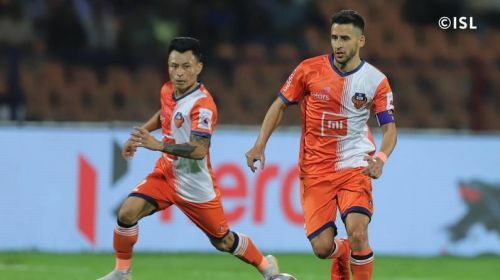 FC Goa will again have Ferran Corominas at the attacking end. The Spanish forward will be supported well from the wings by Jackichand Singh. It would be a chance for Lobera to try out this combination ahead of the crucial playoff matches. Chennaiyin FC will have huge expectations Jeje Lalpekhlua for one last time. The Mizoram striker who failed miserably at his duties this season will have to step up at least now. Overcoming the Goan defense would be a task, but one which can be easily done by the 28-year old.